A fragment of a single chain of DNA, taken from a Z-helix. Click for 3D. The 3D coordinates of this fragment were obtained by taking a crystal structure of a Z-d(CGCG)2 containing oligomer, editing (to remove water, and superfluous bases) and subjecting it to ωB97XD/6-311G(d,p)/SCRF=water geometry refinement. This should be accurate enough to recover dispersion attractions, and various electronic and electrostatic interactions. Z-d(CGCG)2 was then reduced to the fragment you see above, which is large enough to capture the essence of the Z-helical wind, but small enough to be able to spot things which a larger fragment might overwhelm. The 3D model (click on above to obtain it) reveals that the oxygen of one of the five-membered (tetrahydrofuran) rings has a close contact to the guanine base of 2.85Å. This is some 0.3Å shorter than the combined van der Waals radii, and very typical of oxygen…electrophilic carbon interactions (see discussion here for more details). We can reasonably assume its real. It is supported by a small NBO perturbation term (~1.1 kcal/mol) corresponding to donation of the oxygen lone pair into a C-N π* orbital. The next interaction detected comes from a furanose C-H bond, in which the hydrogen approaches to within 2.48Å of the oxygen on the furanose the other side of the phosphate. This is ~0.14Å shorter than the combined van der Waals distances (remember, even at the actual vdW sum, the attraction is still attractive). Why would an apparently inert C-H bond do that? Such bonds are not normally considered in such analyses. Well, this one is special. 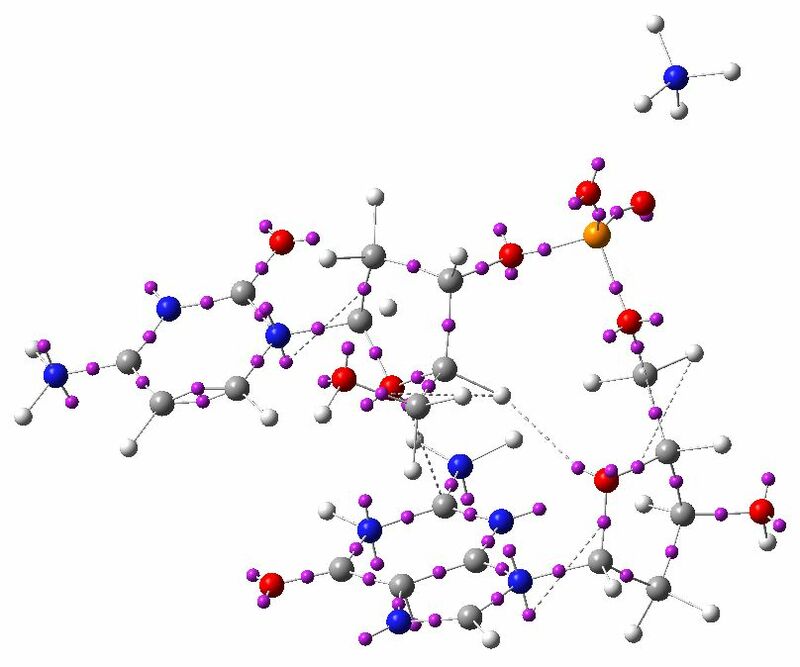 It may well be (slightly) more acidic than normal due to a C-Hσ/C-Oσ* anti-periplanar interaction (E2 5.8, magenta bonds in 3D model) into the CH2-OH bond of the furanose. Hence the acidified H can form a weak(ish) hydrogen bond to the oxygen. The NBO E2 energy is 1.4 from the Olp to the C-H* bond (larger E2 interactions normally occur through bonds, but this one is through space, which is why it is smaller). 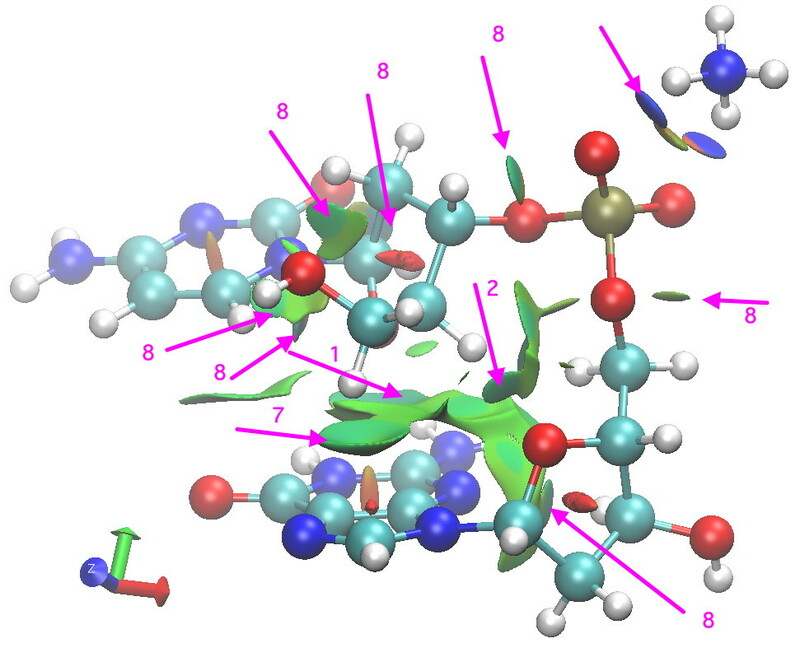 These two interactions in turn set up a good orientation for the guanine to create a strong anomeric effect between it and the ribose; NLp/C-Oσ*; E2 11.6 (violet bond in 3D model, blue bond b in above diagram). To calibrate this interaction, anomeric effects in sugars are of the order of 14-16 kcal/mol. These stereoelectronic effect helps to slightly rigidify the relationship between the guanine base and the furanose it is connected to. 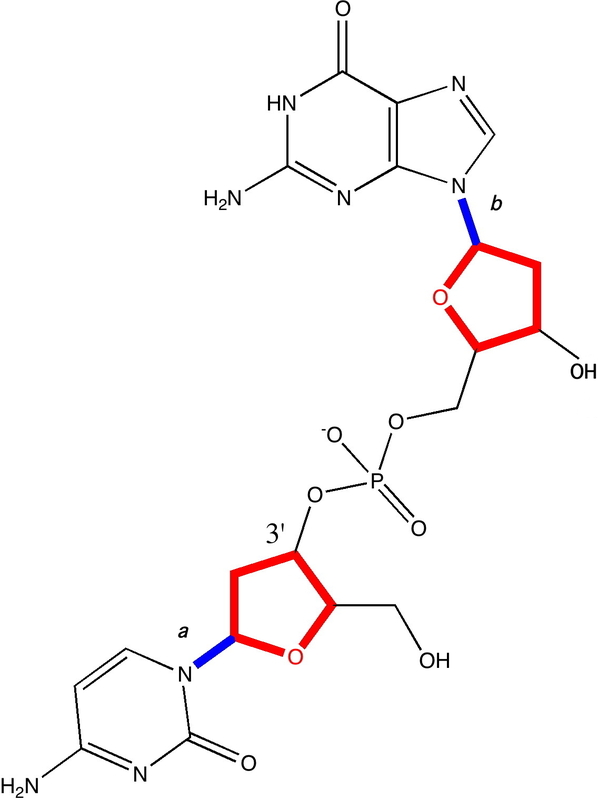 In contrast, the cytosine-furanose link avoids the classical anomeric effect, and instead sets up a weaker one with a C-C bond instead (E2 6.8, indigo bond, blue bond a in above diagram). The Nlp is not as good a donor, because it is sequestered into the adjacent carbonyl group on the cytosine. The guanine has no such adjacent group, and so its Nlp is a better donor. The outcome of all of this is that the two bases, C and G end up having a different geometrical relationship to the furanose they are each connected to. Notice the gauche-like conformation of the ethane-1,2-diol fragment (gold bond in 3D model), which is again due to stereoelectronic alignments. Notice the Nlp …H-C distance of 2.51Å, which like 2 above, is around the sum of the vdW radii. It might be slightly more than just a dispersion attraction, since the NBO E2 Nlp/C-H* through space interaction is ~2 kcal/mol. There are some other relatively close atom-atom approaches, but I do not list them here. Do explore them yourself (they are labelled 8 in the diagram below). To complete the present analysis, I include an ELF diagram. This can locate lone-pairs (as monosynaptic basins) as well as bond pairs (disynaptic basins) and so is useful for visualising the anti-periplanar anomeric effects between a lone pair and a bond (connecting a mono and a disynaptic basin if you like). Some of the interactions described in the list above are shown below with dotted lines (note that some of the lone pairs appear as two basins, distributed either face of the aromatic base). Well, cranking up the magnification on a microscope will always reveal new details. You might ask if these new details matter? Well, since DNA is such a very long polymer, repeating even a very weak (but predictable) interaction millions of times is bound to have some sort of cumulative effect. Who knows which of the ones above might play an important role in the super-winding of DNA, or its packing into a cell, or interaction with proteins, and so on. I do wonder how many of the terms I have identified above have been previously considered for such roles. Anyone know? Postscript: Shown below is a non-covalent-analysis (NCI, see earlier post). A reminder that the interaction surface is colour coded with orange or red tinge if repulsive, blue if attractive, and green for weaker interactions. These surfaces pretty much recapitulate what it itemised above, adding also other interactions not listed above (labelled 8 in diagram). NCI analysis for Z-CG fragment. Click for 3D. This entry was posted on Wednesday, May 18th, 2011 at 2:34 pm and is filed under General, Interesting chemistry. You can follow any responses to this entry through the RSS 2.0 feed. You can leave a response, or trackback from your own site.